"Jesus makes us uncomfortable, causes us to question our daily practices... When kids learn to live in the Spirit of Jesus, they may...become outcasts. "If the angel Gabriel said to me, "Mike, you can only have one youth ministry book for the rest of your life", then this book would be the one I'd choose. Never has a ministry book done more for me personally and in ministry then this one. It's an eye-opening, soul-searching, peace-seeking summons that strikes at the root of what's going in our ministries and in our ministers. 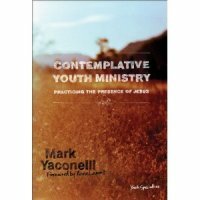 Contemplative Youth Ministry - fruit from the Youth Ministry and Spirituality Project - is all about reestablishing intimate communion with Jesus and to minister from there. If adult anxiety and teen angst are what characterize the culture-at-large as well as youth ministry, then adults' ability to speak into teens' lives is handicapped. Since "anxiety is the inability to be present", then it is practicing the presence of God that must become our remedy. God makes the difference, not us, not the "charismatic leader". And just as much as teenagers make adults anxious, adults do the same to teens. Mark quotes a teen's definition of adulthood, "Adults have no friends, adults have no passions, and adults are stressed out." and then adds, "In a single sentence, this young person was able to articulate the fear I have felt among most young people during my 15 years of youth ministry. More and more it appears to me that this definition represents the nightmare of adulthood most young people are trying to escape." a 20 something, attractive, guitar-playing, charismatic, youth-savvy, hip, hard-working, van-driving, free-spirited, denominationally-loyal, Jesus-loving, Bible-carrying, old-people-friendly, faith-filled, fiscally responsible youth leader (preferably male with decorative facial hair and a mountain bike strapped to his car roof- of, if he's unavailable, a spunky, to-die-for, fashion-conscious female who will cry once on youth Sundays and twice on summer mission trips). Come to me all you who are heavy burdened and I will give you rest. Your ridiculous attempts at ministry are washed away and forgotten. I release you from all guilt and responsibility. I, the savior to adolescents, am all that is needed. Go now in peace and worry not for your children, for they are safe in my tan and well-defined arms. Ministry needs to stop operating out of isolation. Critical of the charismatic-leader model of youth ministry, Yaconelli offers the biblical alternative: a ministry of the beloved community. "A ministry done with others is a ministry of presence... Jesus reminds us that if we're to reveal the reality of God, we must be grounded in relationship." Photo from YMSP.org from one of their formation retreats.Ministry from the heart of a contemplative community has many benefits: a diversity of relationships for the teens, sharing the burdens of ministry, better discernment of where the Holy Spirit was moving, overcoming the hyperactivity of the culture, and even the self-discovery that comes with being real with one another. Mark lays out a plan to discern just how to develop such a community that is very practical and centered on trust, not fear. What I like about this book is that it is blatantly obvious. See, the world has a lot more money and is a lot better at entertainment, humor, music, and excitement. A parish-based youth department doesn't have the budget to compete with MTV or Hollywood. So maybe we should stop trying! Instead, let's offer the one thing that the Church has a monopoly on: Jesus. This book is perfect for Catholics. Mark Yaconelli quotes from a dozen saints and theologians from the Catholic Church because our spirituality is ordered to contemplation (like liturgy). Mark offers really good suggestions for improving your ministry, like developing a team of Advocates who speak up for youth ministry to the parish and who bring parish concerns to youth ministry, and also the "Liturgy of Discernment", which is a modified Ignatian spiritual exercise, to guide both the big and little directions your ministry is moving. Contemplative Youth Ministry best embodies the new evangelization. This book is real inspiration for contemplative action at the core of the new evangelization. His push for smallness, for intimacy, for prayer and prayerful action, instead of programs! events! activism! is not only refreshing, but better than all alternatives. Jesus alone is the Savior. Humility in contemplation will wake us up to this reality, hopefully sooner rather than later. So let's take a deep breath, say his name, and start putting him back in the spotlight.